This article is about the location. For the quest, see Yngol's Barrow. Yngol Barrow is a barrow northeast of Windhelm on the south bank of the White River. Yngol's Barrow: Find the treasure unlocked by the Coral Dragon Claw. The layout of the barrow is fairly linear: there are twists and turns but the main path will not split. There are no enemies until you face Yngol's Shade. Bouncing blue orbs are found throughout the barrow and will follow you around. At no point do these orbs become hostile and they disappear when you claim the Helm of Yngol. There are several standing stones in front of the entrance. There is a short flight of stone steps leading up from the shore, through a squared arch to a statue with twin piles of stones on either side and a circular stone dish in front holding some kind of offering, including sprigs of snowberries, foodstuffs and a copy of Yngol and the Sea-Ghosts. Larger statues flank the entrance which is marked by a lit brazier on a stand. There is an iron ore vein and a cluster of slaughterfish eggs on a small island a few paces to the north. Upon entering you are in an ice tunnel descending to the north. At the bottom is a lit torch on the left. After a slight turn you will see the first of the blue orbs. If you have a follower with you they will remark about finding an old ruin. 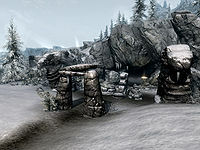 Just after seeing the orb there is an open sarcophagus on the right with a dead draugr lying on the ground and you will pass through a section with typical Nordic barrow architecture. Continue following the icy passage as it twists and turns until there is a turn to the north and ahead you can see two more upright sarcophagi, the right hand of these has a dead draugr behind the lid and the passage is to the right of it. The passage opens up into a room with rotating pillar on either side and a closed gate ahead with a lever in front of it. 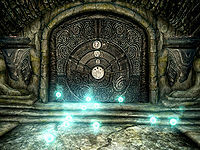 The rotating stone puzzle is solved by reading Notes on Yngol Barrow, found on the dead scholar in front of the gate. The notes give a translation describing three animals in their habitats. To your right, as you face the locked gate, you will find an alcove with a throne, and an alcove with running water: the pillar in this alcove must be turned to the Whale symbol. On the opposite side, there is an alcove covered in weeds and plants: its pillar must be turned to the Snake symbol. The pillar in the last alcove, with sunlight shining through, must be turned to the Eagle symbol. The throne opposite the sunlit pillar requires no action on your part. Pull the lever once you have positioned the pillars correctly to continue. Beyond the gate are some catacombs, there are two large urns opposite and the passage turns to the north and becomes an icy tunnel which passes through some shallow water before descending and entering a natural cavern with a bridge crossing some shallow water. Underneath the middle arch of the bridge are an unlocked chest and a burial urn. Across the bridge is an iron door with flights of stairs leading down behind. At the bottom is a gate with a lit brazier behind. There are several hanging moss and two burial urns here. The passage turns to the southeast and then to the northeast. Through another iron door is a wider passage with a passage off the to the left and ahead is an adept-locked gate, behind which is an alcove containing an unlocked wooden chest, three burial urns, a steel greatsword (which may be hard to see behind the chest) and a random pair of boots. There is also a salt pile in front of the chest that cannot be interacted with. There are also many more hanging moss growing down the wall behind. Following the passage to the left leads to a small room with a random greatsword hanging in the air above twelves sprigs of snowberries. The passage continues to the northeast, near the end is a pressure plate that triggers a spike wall to slam down from above in the doorway, moving slowly avoids damage. The doorway is at the top of wide stairs down into a room that has suffered quite a bit of damage. 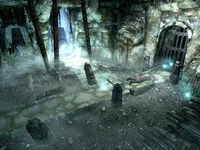 There is an overturned, unlocked chest and a dead draugr among the rubble, while opposite are several upright sarcophagi covered with thick cobwebs and a dessicated corpse on the floor in front. There is an open door on the right-hand side of the room leads to a passage with a puzzle door at the far end. The combination is found on a coral dragon claw which you may find on a pedestal earlier in the barrow, or by visiting Birna in Winterhold. The correct combination for the puzzle door is (starting from the outer ring): Snake—Wolf—Moth. There are no negative consequences for incorrect guess. Behind the puzzle door is a tomb with a throne. 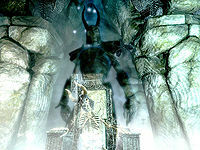 A ghost-like draugr or dragon priest (the bright mist in the room makes him hard to see) will animate and attack you once you step in the room. Depending on whether or not you have the Dungeon Delving quest (see notes), this encounter may lead you to obtain the Helm of Yngol or the Helm of Winterhold. The throne is in the center of the room facing away from you with an unlocked chest behind it and a random two-handed weapon on the floor to the left. There is a dead draugr in an alcove on the northeastern side of the room. Beyond the throne, there is a gate that rises when you take the helm. Through the doorway is a second unlocked chest and spiral wooden stairs that provides a quick shortcut to an unmarked exit. You exit to the northeast of the entrance due south of Wreck of the Winter War. Although Birna is a shopkeeper, she will sell the coral dragon claw for 50 gold through a separate dialogue option. If you're in Yngol and not doing the Yngol's Barrow quest, you will not be able to get out through the back gate and will have to retrace your steps. This appears to be intentional. To get at the chest, enter the barrow through the alternate exit, which is not marked on your map. Turn right from the main entrance and follow the shoreline north until you come to two logs washed up on shore. Turn right and head towards the cliffs until you reach a little bay with a large rock formation on your right; some of the rocks on this formation have horizontal lines carved on them. Head towards this and you'll find the alternate exit. Once you've offered to buy the coral dragon claw from Birna (even if you didn't actually do so), the one on the pedestal in Yngol Barrow will disappear. The button on the pedestal in the throne room does nothing. The coral dragon claw may be completely missing from the pedestal, and other items may have wedged themselves into the cave's geometry. Simply go to Winterhold and buy the other claw from Birna if this happens. If you have killed Birna then the quest cannot be completed. You can open the console and type player.additem 000B634C 1 to spawn a copy of the claw in your inventory. Entering Yngol Barrow with a follower may cause a glitch whereby the cave is pitch black and neither Character Menu nor Journal buttons work. If so, exit the cave and leave your follower outside. Entering Yngol Barrow may cause a glitch whereby the cave is pitch black. Create a new save inside the cave and reload it. This page was last modified on 4 February 2018, at 14:27.